When you can’t afford to purchase a genuine mined diamond for her, there are easily other types of simulated diamond choices for an engagement ring that look like the real thing. It’s likely that your beloved wants the proposal and your undying love for her more than she cares about the kind of rock she wears on her finger. If it’s really important, she can pick out a ring later on your five-year anniversary! Radiant cut CZ engagement rings for women come in stunning designs, and honestly, she might never even know the difference unless you tell her. There are some truly beautiful choices. 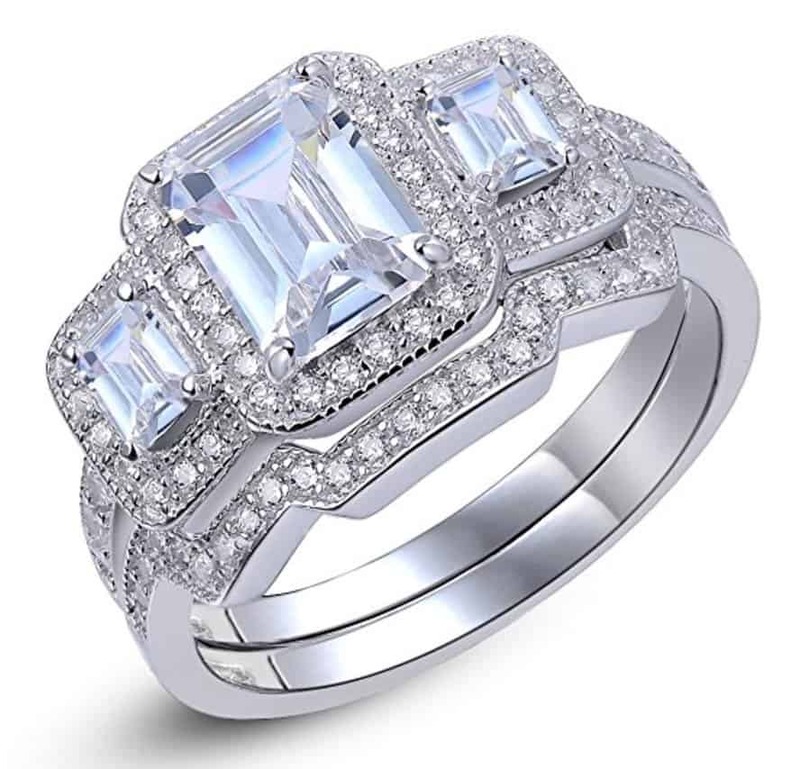 We’ve included just 6 radiant cut Cubic Zirconia rings, but we easily could have listed 10 or 12 since there were some amazing rings. The band is what’s often the most important part of the ring. If it turns her finger green, it’s not going to be a ring that she loves forever. This ring is made with solid sterling silver with the traditional .925 stamp on the interior. It’s Rhodium plated to ensure that it stays bright and shiny for years. She won’t have a bad reaction to this ring. It’s available in sizes 4 through 11. The trio of stones are radiant cut with a width of 8 mm. It’s a total of 2.85 carats of CZ diamonds. This stunning ring is sure to catch the eye of all her friends and co-workers. It’s a beautiful ring with a real .925 sterling silver band. The total carat weight of the CZ diamonds is 3.3 ct. The center, radiant cut stone is 2.5 carats with a halo of smaller round CZ stones surrounding it. 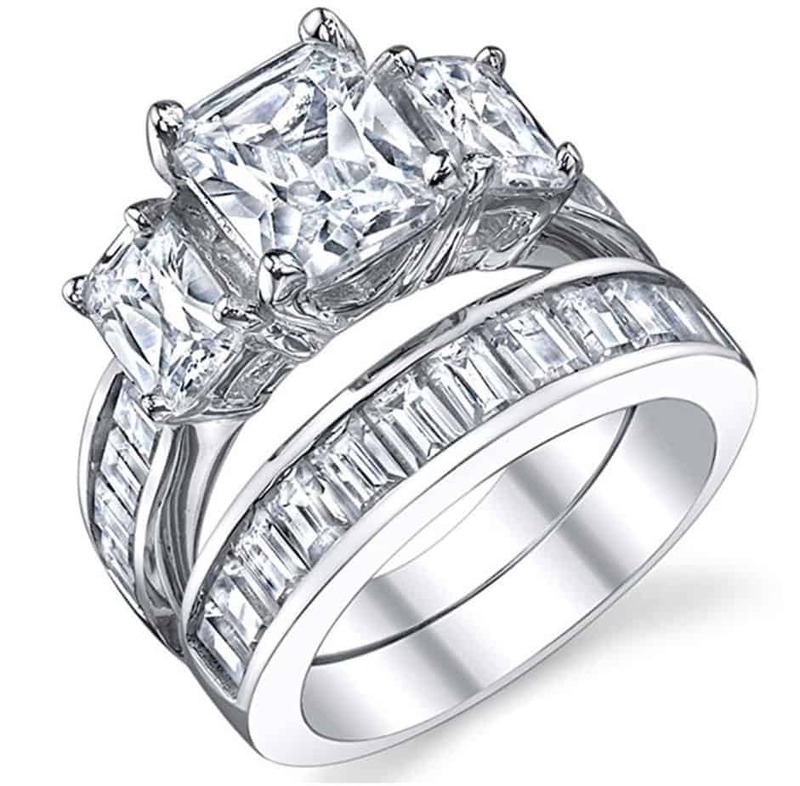 The ring comes in sizes 6, 7, and 8 but it is resizable, which might require some extra work before you can present it to her. It would be completely worth it since this is such a stunning ring. The main stone in this ring is 3 carats with a total weight of 3.50 carats in the entire ring. The band of has a beautiful channel of CZ diamonds surrounded the main stone. The radiant cut main CZ diamond measures approximately 9 x 7 mm and truly sparkles on the finger. The band is crafted of sterling silver with the required stamp of .925 on it. It’s rhodium plated for a shine that will last forever. This ring comes in sizes 4 through 11. 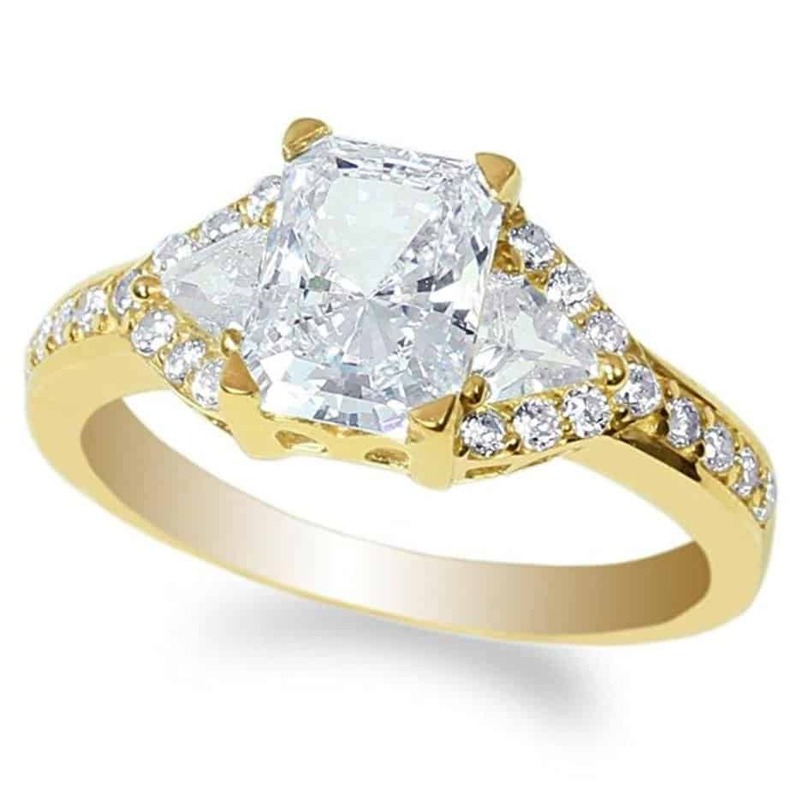 This ring was created using yellow gold and features a 1.8 ct high quality CZ diamond. 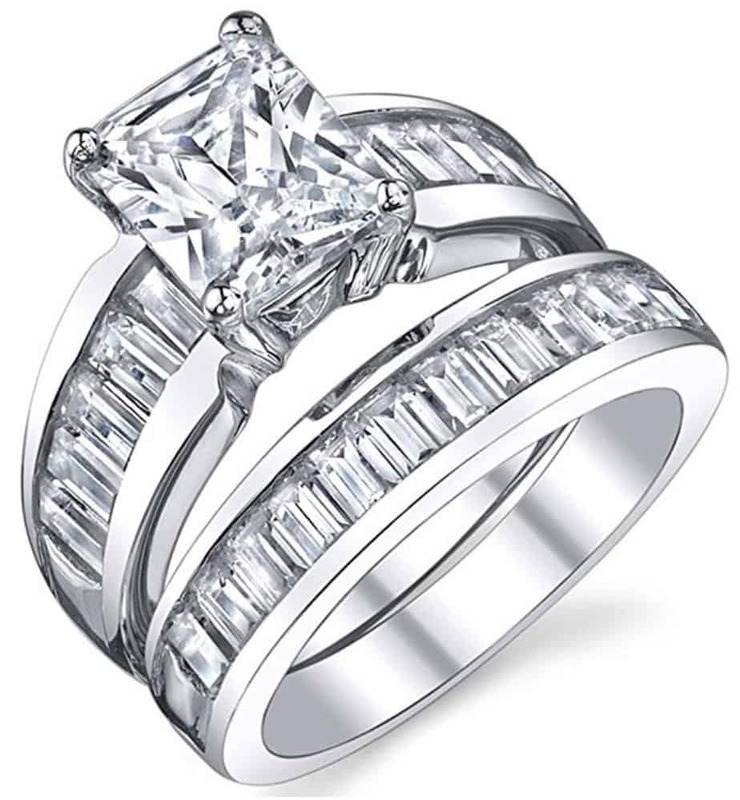 The ring measures 2.28 mm and comes in sizes 4 through 10. This ring comes with a free year warranty as well as a pretty little box for your proposal. The middle stone subtly blends with the stones on the side to create the illusion of a larger solitaire, which we believe is a nice look. 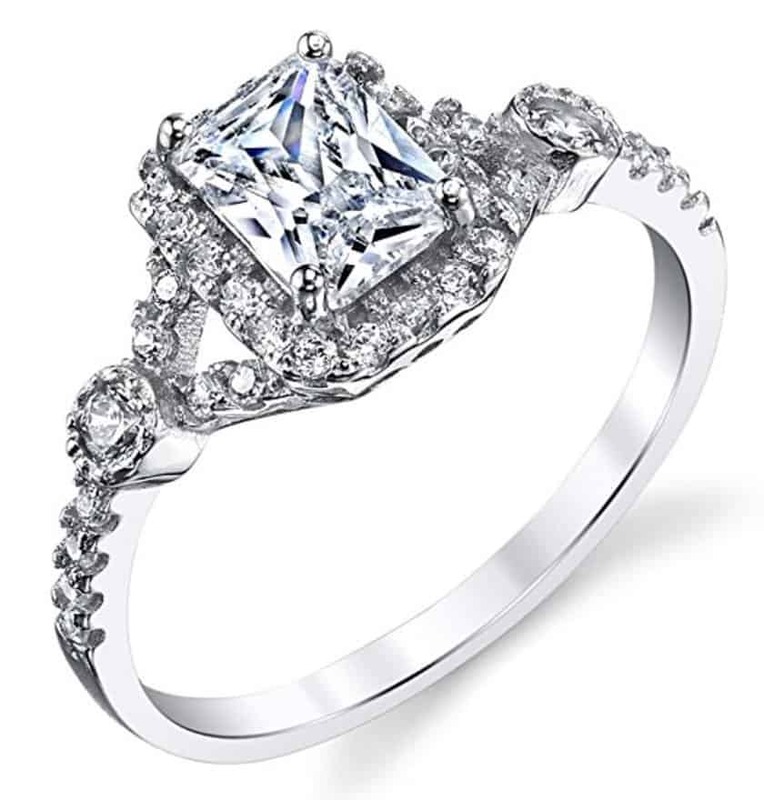 She won’t be disappointed with this beautiful solitaire CZ engagement ring. 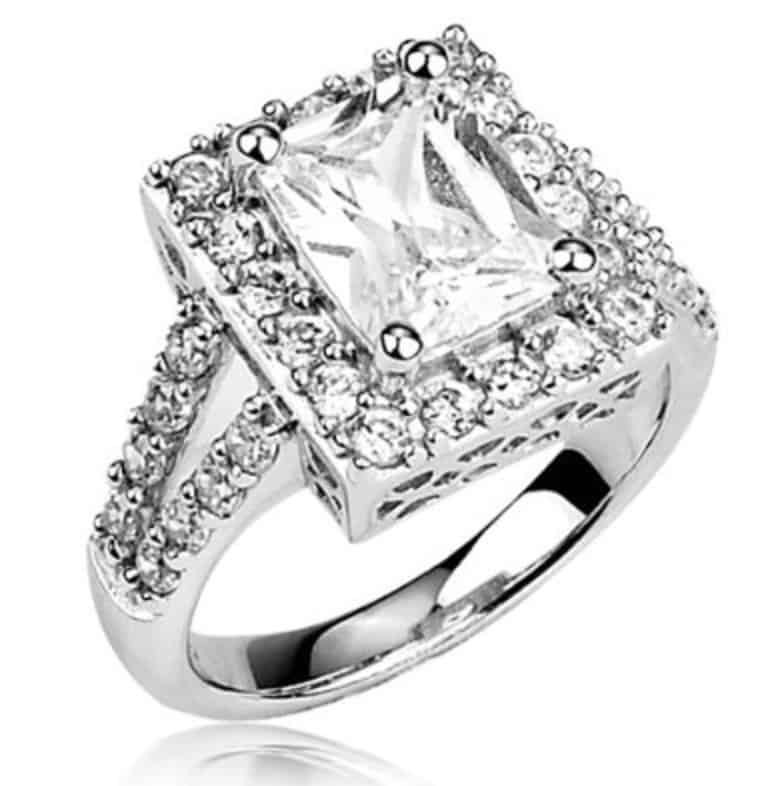 This bridal wedding set comes with a huge main stone of 6 x 8 mm and two side stones of 4 x 3 mm. Surrounding the main and side stones, there are 70 round stones. The band has a channel setting of 26 more CZ stones. This ring is completely drenched in CZ diamonds. The band is made from .925 sterling silver with a total carat weight for the smaller stones of 1.25 carats. This incredible ring is perfect for the woman who loves a bit of vintage to her jewelry. The sterling silver band for this band is covered in a coating of platinum rhodium overlay to protect and keep the shine for many years. Sterling silver has a tendency to tarnish unless it’s polished constantly. The coating should keep it from tarnishing as fast. The CZ diamond in the middle is white with a clarity of VVS-1. The middle CZ is 1.81 carats while the surrounding CZ stones are 0.82 carats. Some of the other rings on this list are weighty and substantial. If you want a delicate ring for your lady, this is a nice alternative. It runs in sizes 5 through 9, which is a broad range to fit most fingers. When held up against a real diamond, it can be tough to tell the CZ from the diamond. These types of rings have come a long way. They’re affordable alternatives to buying an expensive diamond when you could be saving money for your new life together. In fact, some people purchase a real diamond and a radiant cut CZ diamond engagement ring for women who are quite active or don’t want their ring to get stolen when they’re on vacation.